Sesame seed paste and cumin give a subtle hint of spices. Grill brinjals over open fire until the skin is blackened. Remove and peel. Grind in a blender. Add garlic, Tahini, Ground Almonds, Lemon Juice and cumin. Chop half of the mint and stir it into the Dip. 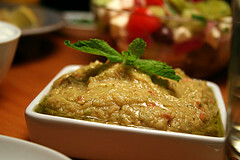 Spoon the dip into a bowl, scatter the remaining mint leaves on top and drizzle with Olive oil. I have tried it and it goes well with fried items .